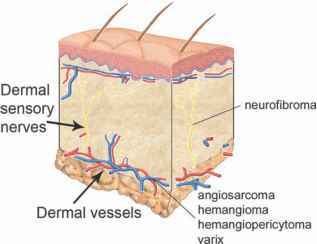 INTRODUCTION Dermatofibroma is also known as a fibrous histiocytoma. It is a common benign cutaneous tumor of unknown etiology that is more common in females. Although these tumors occur most commonly on the extremities, they have also been described on the eyelids. These lesions represent multiple variants of tumors derived from fibroblast precursors and are frequently referred to as fibrous histiocytoma, nodular subepidermal fibrosis, and sclerosing hemangioma. CLINICAL PRESENTATION These lesions are usually asymptomatic, but can be associated with tenderness and pruritus. They most often present as slowly growing 2 to 10 mm, hard, singular, skin colored to yellowish dome-shaped nodules attached to the overlying skin. This attachment results in a central dimple when compressed laterally. They may be present and static for years or even decades. In immunocompromized hosts, lesions may be multiple. Occasionally the color can be reddish due to hemosiderin deposits. If near the surface the mass may have a yellow or pearly white appearance. (Courtesy of Robert A. Goldberg, M.D.) Prominent vascularity may result in a picture simulating a regressing capillary hemangioma. Such tumors are often referred to sclerosing hemangiomas. Spontaneous regression has been reported leaving a depressed hypopigmented postinflammatory scar. HISTOPATHOLOGY These are poorly demarcated lesions composed of varying numbers of fibroblast-like cells, histiocytes, and blood vessels. Numerous histological variants occur in the skin. These are uncommon tumors of the eyelid, and they usually have interlacing spindle cells in a vague cartwheel (storiform) pattern. There may be scattered multinucleated giant cells of the foreign body or Touton giant cell types or large histiocytic cells mixed in with the spindle cells. The overlying epidermis may be acanthotic and papillomatous. Immunostains for factor XIIIa and CD34 may assist in differentiating a dermatofibroma (factor XIIIa positive and CD34 negative) from an early dermatofibrosarcoma protuberans (CD34 positive and factor XIIIa negative). DIFFERENTIAL DIAGNOSIS The differential diagnosis includes keloid, blue nevus, xanthogranuloma, keratoacanthoma, pilomatrixomas, melanocytic nevus, trichomatrixoma, basal cell carcinoma, squamous cell carcinoma, and malignant melanoma. TREATMENT Treatment is generally not necessary as long as the diagnosis has been established. For lesions that are of cosmetic concern simple surgical excision is recommended. Baraf CS, Shapiro L. Multiple histiocytomas: Report of a case. Arch Dermatol 1970; 101:588-590. Betharia SM, Ramakrishna K, Sen S, Kashyap S, Thanikachalam S. Dermatofibroma of the eyelid: a case report. Orbit 2000; 10:161-164. Henkind P, Schultz D. Dermatofibroma of the eyelid. Am J Ophthalmol 1968; 65:420-425. Jakobiec FA, DeVoe AG, Boyd J. Fibrous histiocytoma of the tarsus. Am J Ophthalmol 1977; 84:794-797. John T, Yanoff M, Scheie HG. Eyelid fibrous histiocytoma. Ophthalmology 1981; 88:1193-1195. Jordan DR, Addison DJ, Anderson RL. Fibrous histiocytoma. 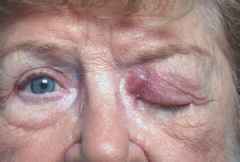 An uncommon eyelid lesion. Arch Ophthalmol 1989; 107:1530-1531. Kargi E, Kargi S, Gun B, Hosnuter M, Altinyazar C, Aktune E. Benign fibrous histiocytoma of the eyelid with an unusual clinical presentation. J Dermatol 2004; 31:27-31. Singh Gomez C, Calonje E, Fletcher CD. Epithelioid benign fibrous histiocytoma of skin: clinico-pathological analysis of 20 cases of a poorly known variant. Histopathology 1994; 24:123-129. Ulloa TK, Anderson SF. Orbital fibrous histiocytoma: case report and literature review. Am Optom Assoc 1999; 70:253-260.